Comments: Evergreen conifer native to Turkey, Iran, and Afghanistan. Needles are dark green and about 3 inches long and are two in in each fascicle. Bark is red brown. 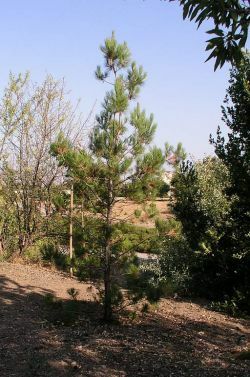 The tree is described as being conical and having an open canopy. Mature height to 100 feet. This is a desert species and will do well with little watering, but it will do better with more.